Have questions? Please give our knowledgeable staff a call at 1 (888) 301-2610. Call 1 (888) 301-2610 for buying advice and our lowest prices! Unit Footprint, In Use 25.6"
Each curved stair lift must be custom manufactured to suit the unique requirements of the site. The unit is manufactured to the exact dimensions of the site application as determined by the digital survey and no two applications are alike. Lifts go into factory production immediately upon submission of the order to the factory which is after customer signs off on the CAD drawing. Accordingly, AmeriGlide has a substantial investment in resources and labor and as such we have a 25% cancellation fee for any order cancelled after the measurement survey but prior to submission for production, 50% once the lift is in production. Once a custom stair lift order has been shipped it cannot be canceled or returned. The shipment cannot be refused. No refund will be made for orders of this status. 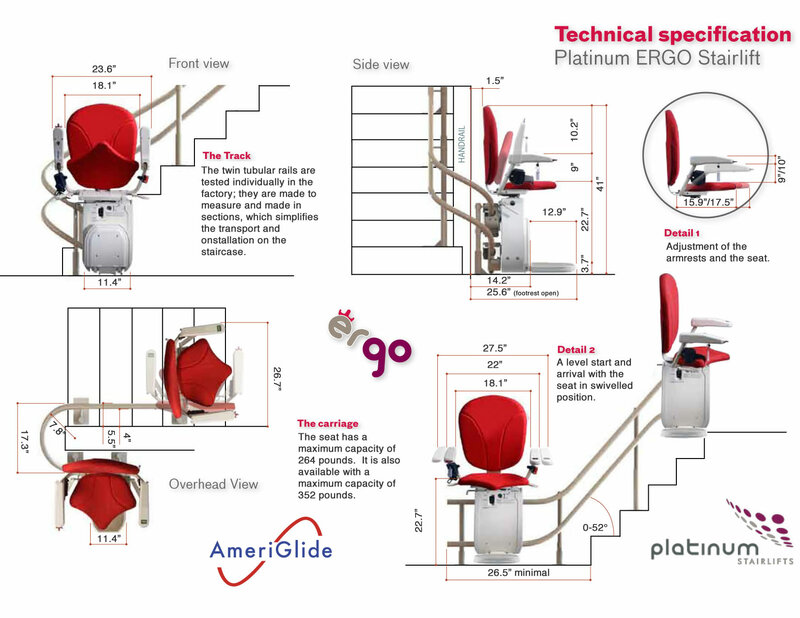 Buy your AmeriGlide Platinum Demo Curved Stair Lift from 4 Stair Lifts and you will enjoy the lowest guaranteed price as well as a fantastic warranty. A stairlift is the perfect solution when mobility problems make it difficult or impossible for you or a loved one to climb stairs. 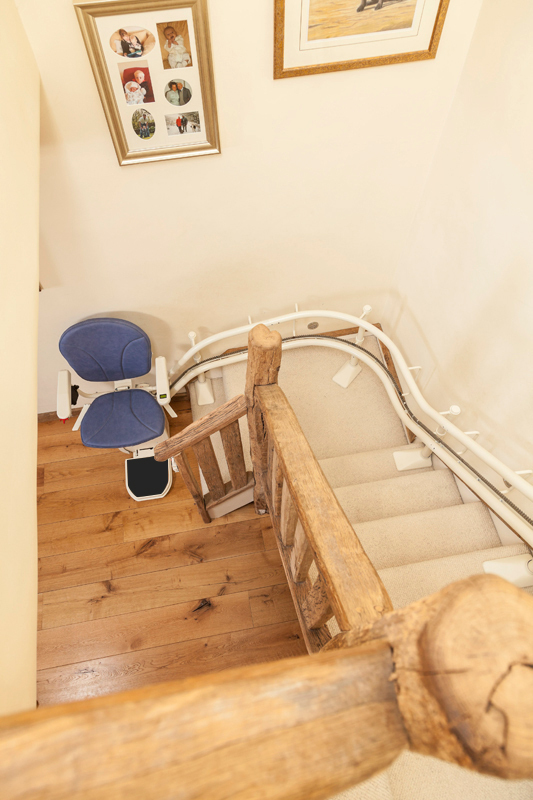 The AmeriGlide Platinum Demo Curved Stairlift is designed to restore independence to those who can no longer climb stairs but may have a staircase with landings or curves. 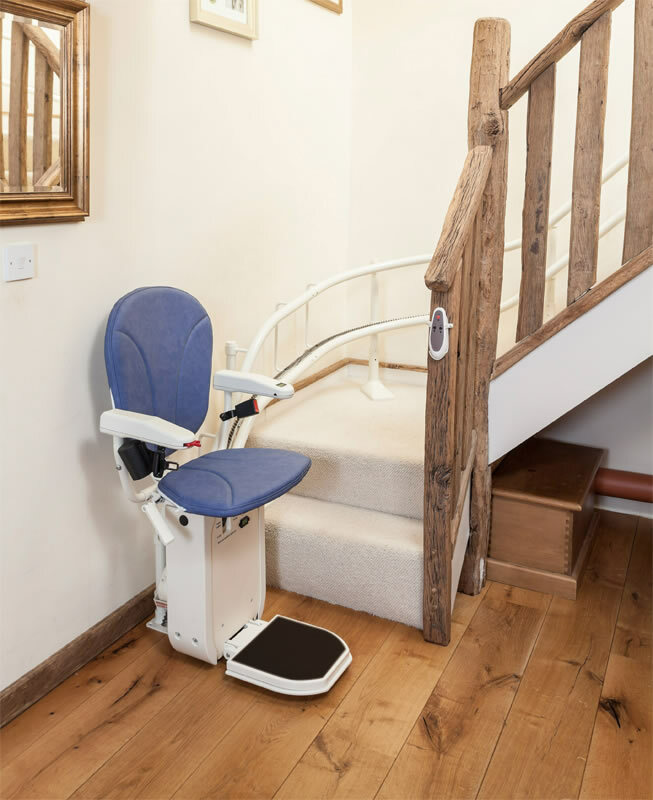 Standard stairlifts are built for straight staircases, but this versatile lift is specifically designed with curves and landings in mind. 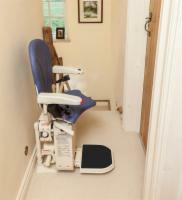 Any stairlift that doesn't quite fit an area can not only be inconvenient but unsafe. Your lift will be hand-built to the dimensions of your stairway, so you know the fit will be perfect. It's designed to be low-profile and take up a minimum amount of space, so you don't have to worry about it ruining the look of your stairway or decor. And it can even be mounted to the stair treads themselves rather than the wall, for more convenience. You don't have to give up great features like a retractable seatbelt and convenient swivel seat just because you need a curved stairlift. Choose the AmeriGlide Platinum Demo Curved Stairlift today to enjoy an incredible deal! Our demonstration models are gently used in store for a short period of time before being refurbished and made available to the public at a discounted price. You can increase your mobility for a great low price! Check out the full installation video! 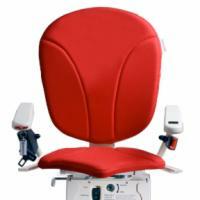 Why buy an AmeriGlide Stairlift? We can give you 10 reasons. 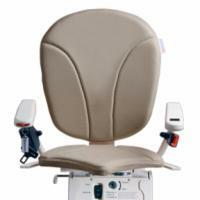 AmeriGlide is the quality manufacturer of stair lifts and other mobility products. 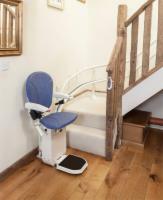 There are many many reasons to buy an AmeriGlide stair lift. Check out what some of our customers have to say in the Testimonials section of our site. The following Ten Best Reasons to Buy an AmeriGlide Stair lift comes directly from the President of AmeriGlide. Quality: AmeriGlide refuses to have the quality of our stair lifts surpassed by any manufacturer. We back our quality up with a 10-Year Drive Train Warranty and a 5-Year Parts Warranty. Please see the warranty section of our site for details. Reliability: Each part of the AmeriGlide stairway lift has been designed to make sure you can depend on your lift when you need it most. Little things have been added such as a power indicator light on the track assuring you that unit is ready to use. The aircraft cable in the drive system is rated 4,200 lbs. breaking strength. A spare fuse is under the 115-volt plug so you can replace it yourself if necessary. The motor and gear have been tested in excess of 30,000 cycles equal to 16 years of use and neither showed excessive wear. Last but not least, AmeriGlide stair lifts do not have circuit boards which are prone to failure for a host of reasons from power surge, lightning, to poor construction. 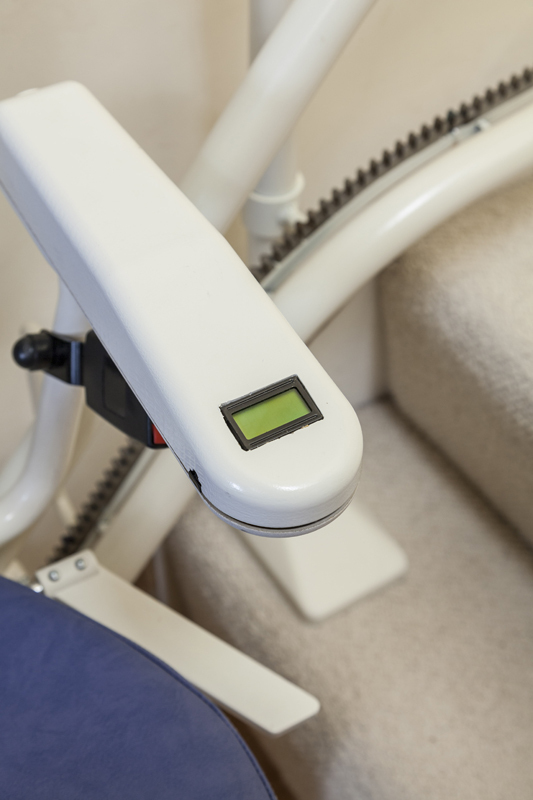 Minimal Maintenance: As strange as this may sound for a mechanical device, there is simply very little maintenance required for the AmeriGlide stairlift. Lubrication of the track is needed every 4-6 months. Nothing more! The gearbox on the AmeriGlide stairlift is completely sealed, preventing the possibility of oil leaking onto your carpet unlike most lifts that have gearboxes with vent plugs. Also, virtually all other lifts use rack and pinion gears to drive the lift. These must be lubricated with dust-collecting grease to prevent damage from occurring. AmeriGlide?s cable drive system does not require lubrication, allowing you to leave dust-collecting grease in the garage. Peace of Mind: The AmeriGlide stairway lift was designed to make sure nothing was missed. Footrest safety sensors stop the lift in either direction should it strike anything on the stairs. 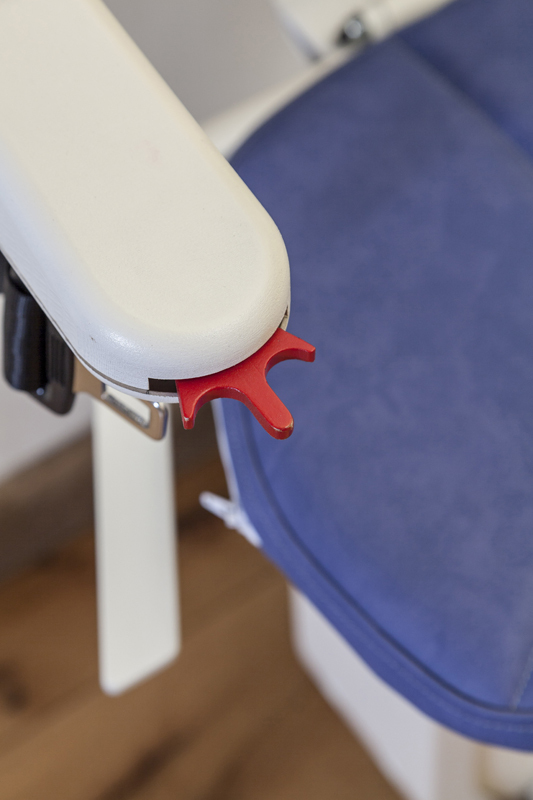 The seat is equipped with a seat belt and a safety switch that prevents the unit from running unless the seat is in its proper position. Limit switches shut the unit off in the same place at the top and bottom of the stairs automatically. This is our way of offering you and your family member's peace of mind regarding your safety. 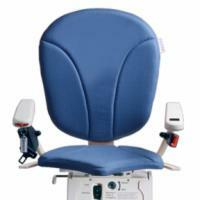 Comfort/Safety: The AmeriGlide stairlift has a wide, thick, padded seat that folds up when not in use. The large rocker switch on the arm of your choice and a 180-degree swivel seat make using the lift simple. The fold-up footrest adjusts give your feet support and the backrest makes sure you are as comfortable as when you are sitting in your favorite chair. 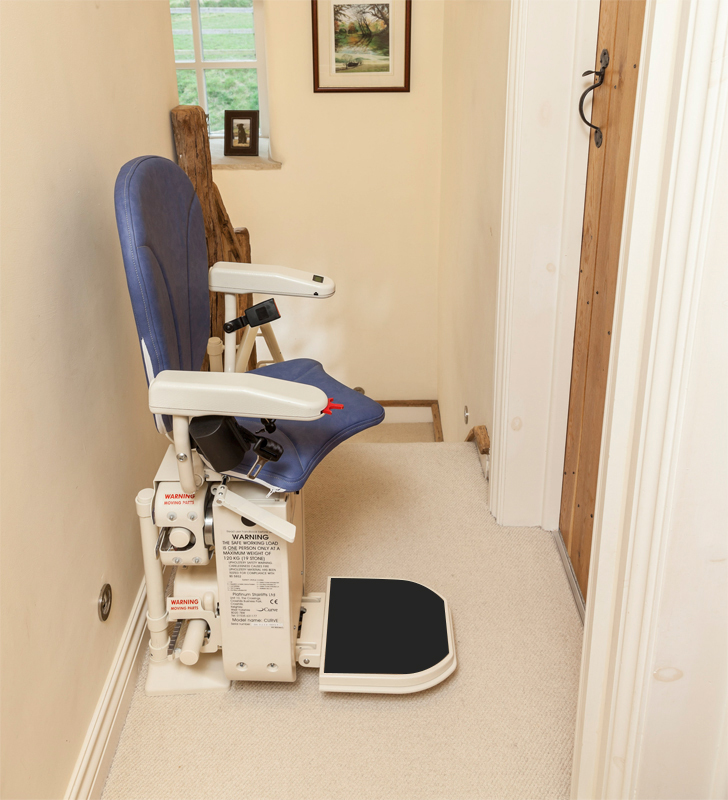 Every facet of the lift was designed to enable you to relax and enjoy using your AmeriGlide Stairlift. Flexibility: The AmeriGlide stairway lift can be placed on either side of a staircase, and the unit control can be placed in either arm. By adding or cutting the track, you can modify the length of the unit should you ever need to relocate. 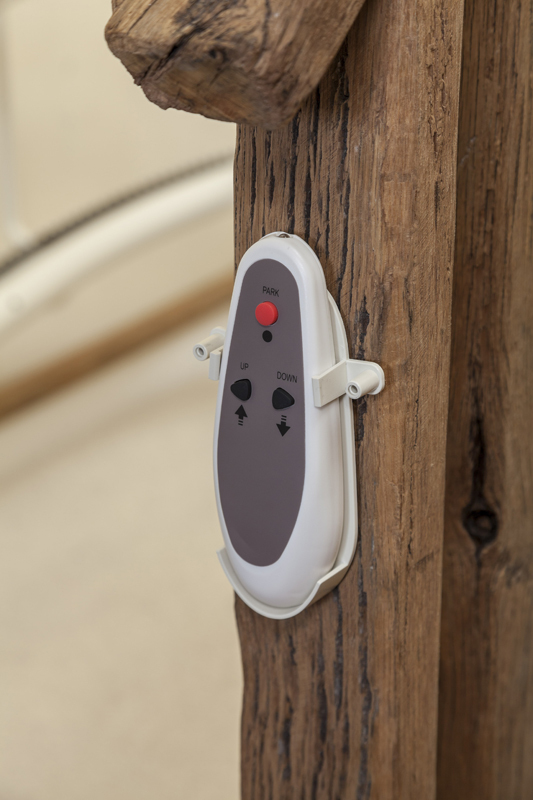 Standard call controls are mounted on the floor at each end of the staircase and can be placed on the wall and operated by hand. Either location allows you to call the lift to you regardless of where the lift is on the track. This flexibility enhances the resale value of the lift, and yes, the warranty is transferable should you decide to resell your lift! Easy Installation: AmeriGlide stairlifts were designed and engineered from start to finish with homeowner installation as the end objective. 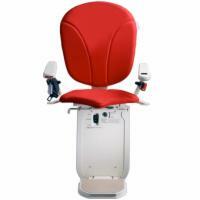 The result is a stairlift that is unsurpassed in ease of installation. The heaviest part of the lift is 100 pounds allowing for a true one man installation. We have eliminated any stripping or connecting of individual wires and created a system that simplifies installation of the base unit onto the track. Technical Support/Service: Our technical department is open Monday through Friday, 8:00am to 5:30pm. We will not be surpassed by any manufacturer in service or support. Warranty: Our warranty is unsurpassed in the industry. We offer the only 5 year warranty on 100% of the component parts of our lift. No exceptions, no exclusions, no games! Value: The AmeriGlide stairlift is the best value in the industry today. Of course, we have the best price, but value is more than just price. We also provide all the elements that create value for our customers, including quality, service, support, reliability, and warranty. We want to thank you for considering AmeriGlide as your stair lift solution. You can pay more for a stair lift, but you can't buy more value than AmeriGlide Stairlifts. 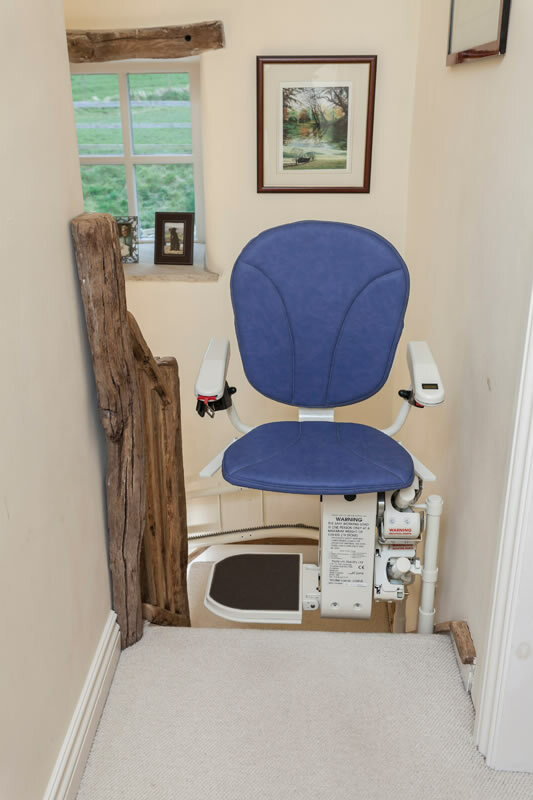 Let us help you regain your freedom with AmeriGlide Stairlifts.